To get the attention you deserve, a well-written introduction is required. No matter if it is an email, a blog post, a recommendation letter, or anything else, if the introductory paragraphs do not hook the reader, the whole piece is ignored. Furthermore, starting an introduction free the flow of words of a writer. Without an introduction, even with a plan, you are stick in front of a blank page. 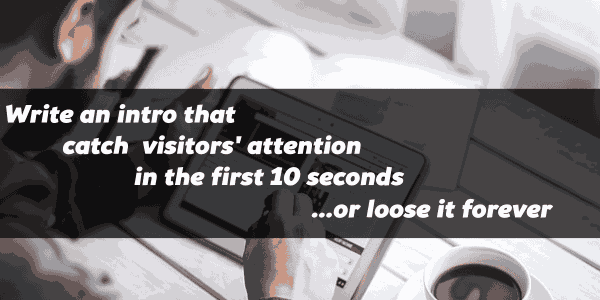 As you want to convert your visits into leads, you’d like your visitors to pay attention to your content. But hooking online readers is not an easy task. They want to do so much things at once that you only have 10 to 20 seconds to catch their attention. Fortunately, you’re not the only one who want to get the attention of your visitors and facing difficulties achieving it. And, when you’re not the only one struggling with a problem, it means people worked on a solution. How to fix that problem? It starts with an effective introduction. The following tips help whatever you’re writing a blog post, an email, a video script or anything else. However, to keep it simple and practical, we give the focus to blog post introduction as we explain and suggest you some awesome reads. To write a blog post introduction that matters, let’s follow those 10 proven hacks from 5 experts. To write the shareable, actionable and readable blog post, you need to master each of its elements. Such elements are headline, sub-headings, introduction, body, illustrations and closing. I quickly addressed blog post introductions in the above referenced post, and, I gave you some examples of introductions that work. Now, I want to share with you more proven tips from established experts. Remember that you’re not collecting information from all over the internet. It is not your goal. You want to learn how to get visits to your website, convert them into leads and build up an online business. With that in mind, Keep those proven tips handy or best, bookmark ( CTRL + D ) that page so you can check them back when you’re writing an introduction. We’re working on a checklist for you, stay tuned! 1.- Start with a fact: Facts build trusts, they pike curiosity. But it does not have to be common; the reader may have seen it somewhere else already and it loose all its effects. 2.- Tell the end of the story: Sometimes, to hook your readers, you need to tell them how the story end. Start your introduction identifying the end results, that way, readers will stay to discover the methods used. 3.- Use an anecdote: Start your blog post with a story to get the reader attention. Share a story of your life, a quote, something funny or even uncommon. But it has to be related to your main subject. Ex: I once read a quote that changed all my life! 4.- Grab the readers’ attention: Start your introduction with something that grab the attention of the reader. Tell a joke, share a crazy facts or stats. 5.- Present the reason why your post exists: To hook your readers, tell them why your post exist in the introduction. Tell them the purpose of the post. If the post address their problem, they’ll keep reading for more. ex: For five years, I’ve been trying to build a business online. Trying every tips I found, but failed. And recently, I found that the exact method was always at my disposal. And I wanted to share it with my loved readers. 6.- Explain how the post will help address the problem: Let the reader know how you’ll address the problem. I have seen it working on Udemy courses, blog posts, sale pages. When you explain how you’ll develop the subject within the introduction, you tell why your post worth consideration. Your unique way to address the problem will catch attention. 7.- Start with an agreement: The 11th tips, shared by Dean, to write an actionable Search Engine Optimized writing that sales, is to write an introduction starting with an agreement. When you start with a concept or idea that your reader agree, they know that you understand them. Perhaps your post may address their exact problem and they keep reading. Then, make them a promise you’ll explain in the article. ex: You’ll agree with me that it is hard to convert strangers into customers? My conversion was really low until I discover one simple tip that changed everything. 8.- Start with a tantalizing questions that pike curiosity: People know, feel and want many things. When you ask questions such as “do you feel that your blog posts deserve more attention?”, you catch your readers attention who feel that you’re talking to him personally. 9.- Use transitions such as and, but, or, yet, nor, well, no, in fact: The purpose of a sentence in your blog post is to lead your reader to the next till your call to action. Sometimes, to make people read your introduction and more of your posts, you just need to connect your sentences together. Your blog post is easier to read and you get your reader attention who feel comfortable with your writing. V. BoostBlogTraffic ( Write opening that grab readers ) by Bryan Collins. 10.- Agitate the problem: It happens that, sometimes, the reader ignore how important it is to fix his problem. It is your job to agitate the problem and grab their attention with a solution. ex: You don’t have enough time to manage your online business; even 48 hours a day seem to be not enough. Trust me, all the advice in the world will not make it better if you don’t follow a plan. Fortunately for you, we did the hard part. Bottom Line: Focus on what the user benefits from reading your posts. Get into his mind to know what interest him. Follow the proven copywriting strategies that work. How To Write Better English with Grammarly Spell Check?